It’s time for tickets to go on sale for our annual holiday concert! 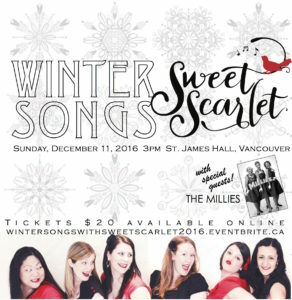 This year’s show, Wintersongs, will be taking place at St. James Hall in Kitsilano on Sunday, December 11th at 3:00pm. We promise to give you a magical, festive performance of a cappella holiday tunes, complete with a little bit of something for everyone. We are also thrilled to welcome The Millies, all the way from Victoria, as our special guests. Purchase your tickets on Eventbrite. For every ticket sold before November 30th, we will donate a percentage of the sale towards our fundraising efforts for Yule Duel, benefiting May’s Place, as hospice in Vancouver’s Downtown Eastside. We can’t wait to see you there!